Illustration—"Burning of the Jews"—from the Nuremberg Chronicle, by Hartmann Schedel, published in 1493. There had to be a reason for the pestilence. Panicked people began to speculate: Perhaps it was caused by a group of folks - like the Jews - who seemed more immune to the disease than others? Maybe the Jews had poisoned wells? Maybe it would be possible to get a confession from one of them? Hysterical people, of course, do not think clearly. Jews were getting sick less frequently because they lived apart from the rest of the population. But, as Boccaccio points out in the Decameron's Introduction, other people were living apart too. And they were still getting sick. Why not the Jews? On Valentine's Day, 1349, about 2,000 Jews were massacred in Strasbourg. (Six hundred years later, Jews were killed in Strasbourg again - this time by the Nazis.) The town council had resisted arresting them. What proof did anyone have of Jewish "evil" doings? But the town council was "deposed," on February 9-10, clearing the way for massive arrests on Friday the 13th. On Saturday - that was St. Valentine's Day - they burnt the Jews on a wooden platform in their cemetery. There were about two thousand people of them. Were any spared? How about the children? Those who wanted to baptize themselves were spared. [Some say about a thousand accepted baptism.] Many small children were taken out of the fire and baptized against the will of their fathers and mothers. And everything that was owed to the Jews was cancelled, and the Jews had to surrender all pledges and notes that they had taken for debts. Did the money have anything to do with the massacre? The council, however, took the cash that the Jews possessed and divided it among the working-men proportionately. The money was indeed the thing that killed the Jews. If they had been poor and if the feudal lords had not been in debt to them, they would not have been burnt. Was Strasbourg's treatment of the Jews an isolated event? 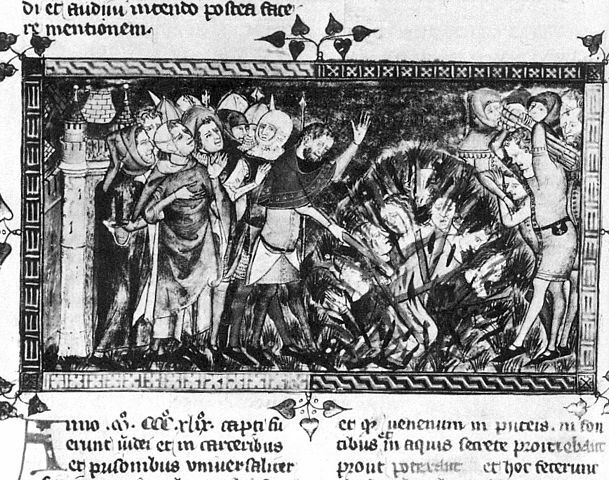 Medieval illustration - "The Burning of Jews (1349)" - included in a chronicle written on the "Black Death" between 1349 and 1352. Used (as illustration 35) in A History of the Jewish People by H.H. Ben-Sasson, ed. (Harvard University Press, Cambridge, 1976), at page 564. Although Jews had been banned from entering Strasbourg for 200 years, restrictions were lifted within twenty years. The story of the horror, however, continues to this day. Bos, Carole "SCAPEGOATS" AwesomeStories.com. Jun 01, 2002. Apr 23, 2019.